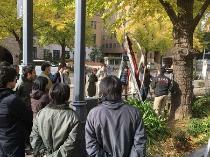 We tell about state of ginkgo of Nihon Odori Avenue. Ginkgo of this year is the last sight soon, too. Ginkgo of fallen leaves is spread all, too and is beautiful. "Ginkgo communication 2017" becomes last at this time. Thank you for your favorite reading. Some today are warm. Pigeon basked in the sun with futon of ginkgo, too. As for the tree which there is tree that leaf has fallen, but still remains. It is fine to describe painting. 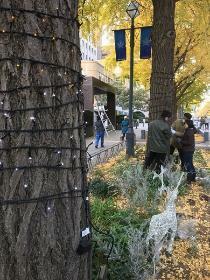 Ginkgo lighted up in positive shined with gold. There seemed to be shooting today. Extras was full in Nihon Odori Avenue. Flavor that road fallen leaves are wonderful. It seems to clear up tomorrow. Ginkgo row of trees of Nihon Odori Avenue is also beautiful at night. It is fine today. Turning yellow of ginkgo is more worth seeing. We planted narcissus and tulip in planting yesterday. It seems to begin to bloom from the end of March. It is a pleasure. We sandwich the weekend, and there may be much which we are worried about what happened to ginkgo. The golden age passed, but is more beautiful. 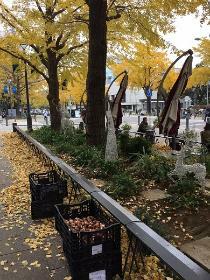 As for the ginkgo, most change color yellow, and thing which begins to be scattered is seen. Scattered ginkgo is tasteful and is wonderful. We take one not to see yet by all means this weekend. It is the height of turning yellow. 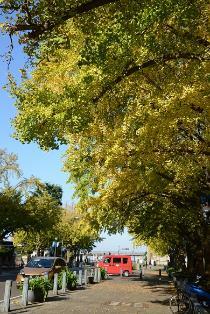 Turning yellow of ginkgo shines in blue sky and is very beautiful. It is felt that dance a lot of scattered leaves are quick in seasonal progress this year. 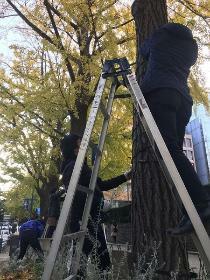 Preparations for illuminations were done in Nihon Odori Avenue. Please enjoy night Nihon Odori Avenue. It became really cold. Season is winter rather than autumn. 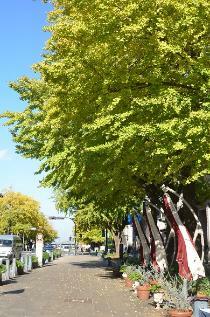 Ginkgo row of trees of Nihon Odori Avenue changed color more and more, and there were a lot of people who took person and photograph which we looked at. Please come to look at everybody by all means. 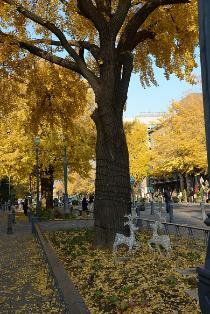 Ginkgo of Nihon Odori Avenue changed color considerably, and quite yellow leaves seemed to increase. Color gradually changes and feels seasonal change. Please come to look at everybody by all means. 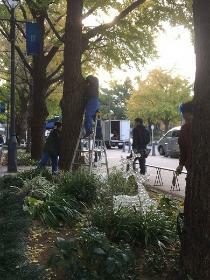 It was jolted for strong wind, and a lot of ginkgos fell today. Yellow shines in blue sky and is very beautiful. 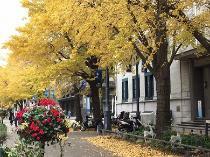 Please come for Nihon Odori Avenue which comes to seem to be autumn day by day. It is very fine and is ideal day for walk today. 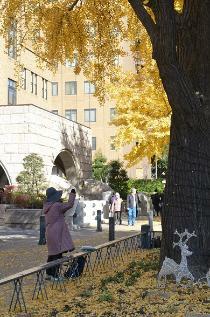 Ginkgo on the sea side changes color yellow and is full of person writing picture and people taking photograph. Fresh green is still seen in the Yokohama Park side. It is fine today. Ginkgo on the sea side begins to change color, and beautiful yellow ginkgo is seen here and there. The Yokohama Park side looks still have just begun. The blue sky and green leaf, yellow leaf are beautiful. In full bloom is long in coming. It is greener generally. Ginkgo which is quick in color becomes yellow. We look forward to this.